Look at the “gloved arch”. It’s a spool-heeled masterpiece that hugs the curve of the foot in suede, soles only where it touches the ground; it gloves everything but the short front sole in one unbroken sweep of texture and colour. 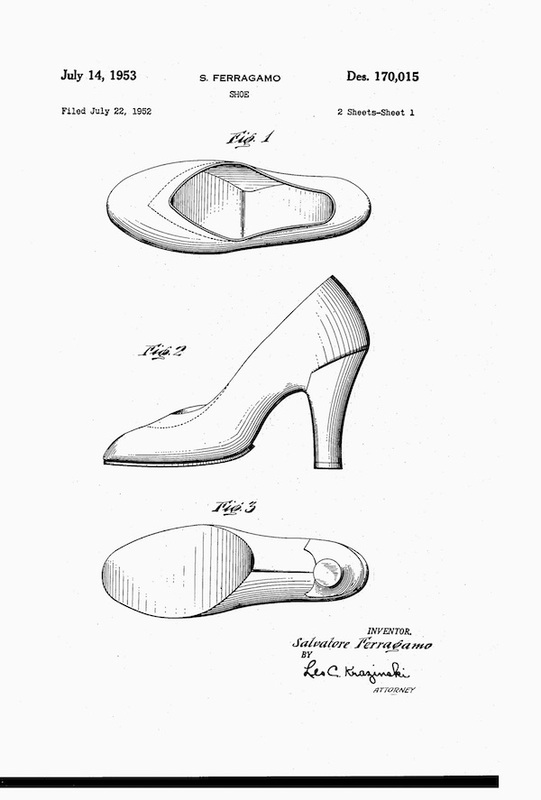 Ferragamo’s newest device toward a more delicate shoe, toward a softer tread. "The gloved arches give more support and the covered toes give more protection, yet, because of the lightweight leathers, these 'closed up' shoes are as easy on the foot as a sandal." 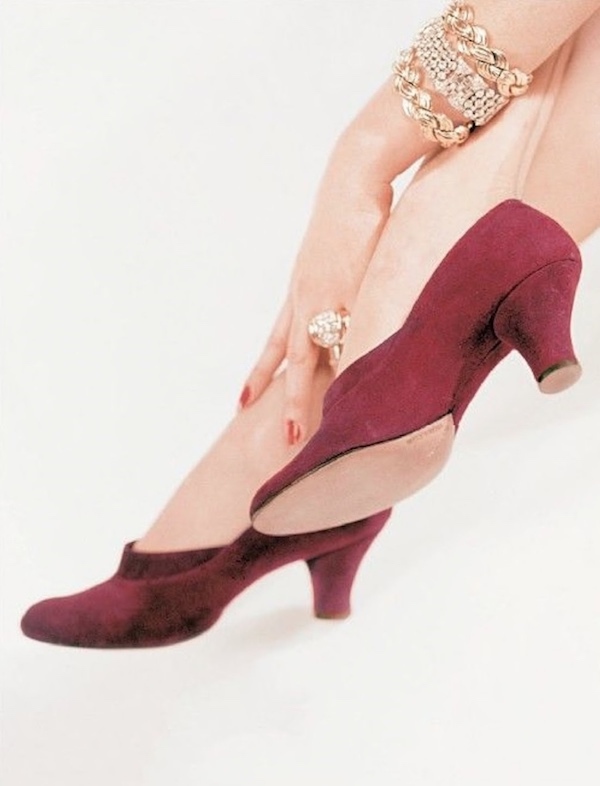 HAS FERRAGAMO CREATED THE WORLD’S MOST BEAUTIFUL SHOE? 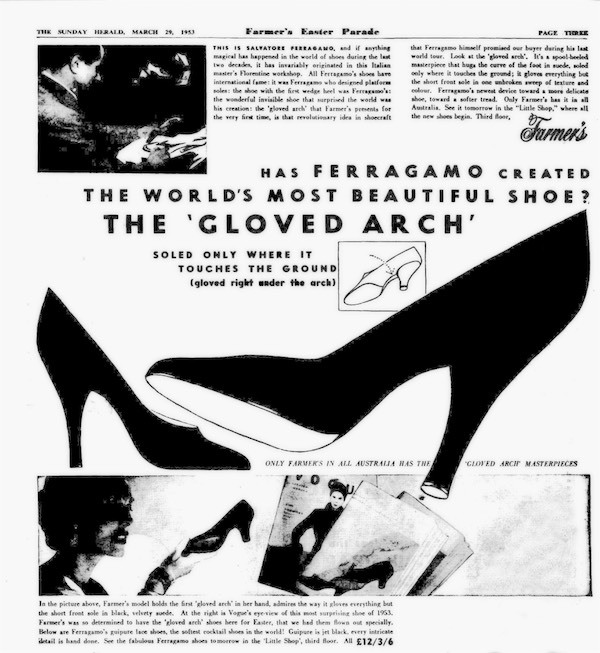 No, we don’t think so, and it is debatable whether the "gloved arches give more support" or not; however it was a clever idea and never seen before. It was patented between April 3 and July 22, 1952 in Italy, France, U.K. and U.S.A.; the British were the last to grant the patent (October 26, 1955), followed by the French (March 16, 1954). The magazine cover seen on the lower bottom of the Sunday Herald ad is Vogue UK and the full page shows the photograph here below. 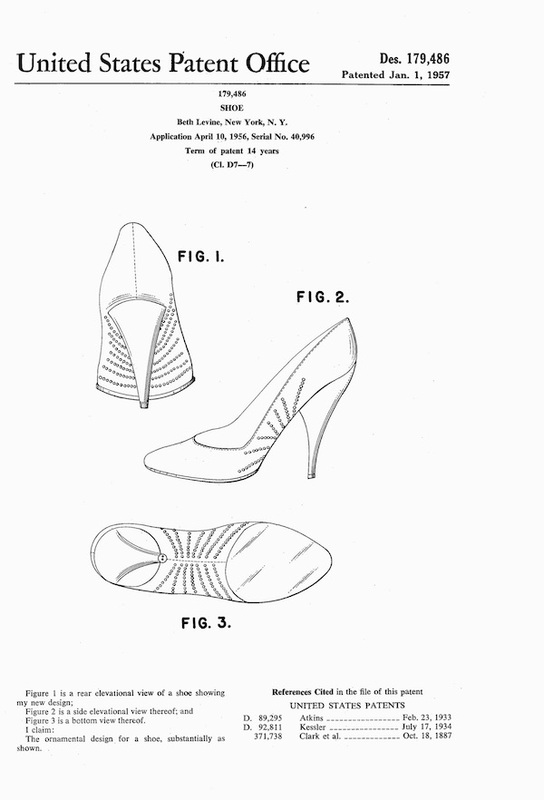 According to the invention a shoe is provided having a heel, an upper the side portions of which are extended in the form of flaps which meet underneath the shank of the shoe and an outer sole which terminates short of the heel, wherein the said flaps are extended rearwardly so as to cover the upper portion of the front of the heel. 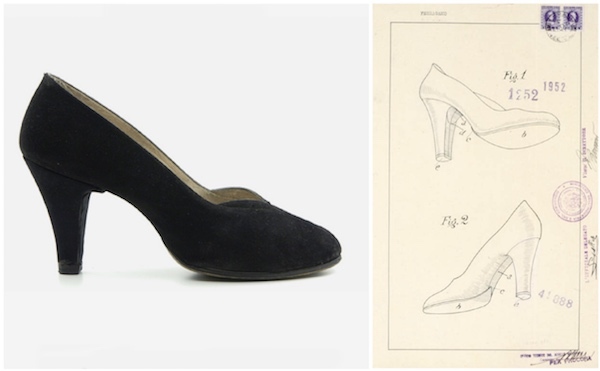 We may be wrong, but shoes with the Gloved Arch can't be found anywhere but the Salvatore Ferragamo Museum. 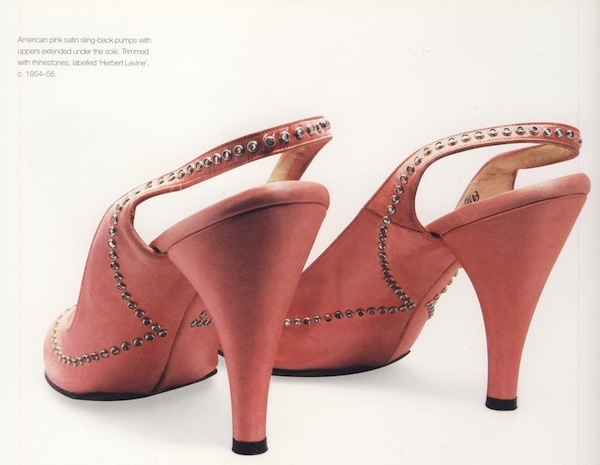 (The model) Under Construction was revolutionary on that it has only a half-sole under the ball of the foot, and the underside of the arch is embellished leather so the shoe will “fit like a glove”. As much as we like Beth Levine, “Under Construction” wasn’t revolutionary - not even in the first place - smart, but not revolutionary. The book also says 1955 even though the American patent was filed April 10, 1956. 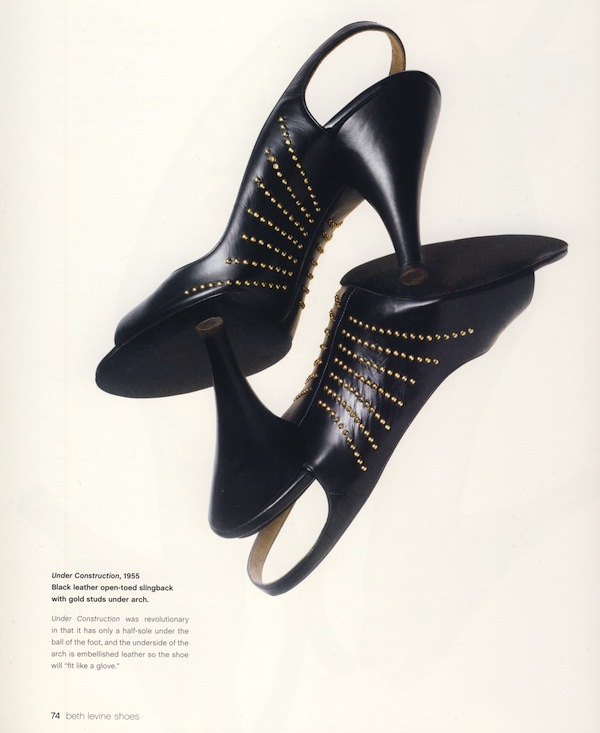 It’s only a guess, but we don’t think Beth Levine knew of the Ferragamo model, nor the “fit like a glove” coming from her, but still, the similarity is striking. Levine’s looks nicer though.